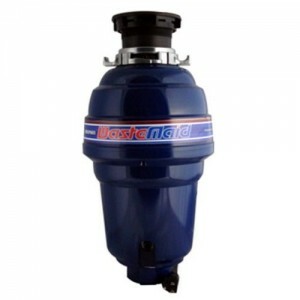 Fully Insulated Sound Chamber with a 1-1/4 HP motor makes this Garbage Disposal shine above the rest… The Waste Maid WM-658 is a very powerful, Heavy Duty grade garbage disposal that is loaded with great features. The WM-658 incorporates Stainless Steel grinding components for a longer lasting operation, with less chance of malfunction. Among the included 10-year warranty, the WM-658 also has a lifetime guarantee against corrosion. Safety when it matters… The Waste Maid WM-658 uses patented Bio Shield technology exclusive to Waste Maid disposer models. Bio Shield technology uses anti-microbial infused plastic parts in all areas that come in contact with waste particles, reducing chance of bacteria growth, reducing build-up and odor. The reduced bacteria growth makes your sink area safer for yourself and others. Enjoy a fully insulated grinding chamber along with a noise-reducing TorqueMaster Grinding System with a turntable blade design which limits stress on the grinding components, reducing noise further, and improving the lifespan of the unit. Safe for Septic Tanks. Over the last 25 years, the Joneca Corporation has been a leading distributor in Garbage Disposal and waste disposal technology products. Waste Maid, a brand of Joneca is distributed in over 50 countries including the USA, UK, China and Japan. Outstanding 1-1/4 HP High Powered Motor grinds through bones, vegetables, stems, sticks, and much more.